I've frequently seen pictures of Cauliflower Buffalo Bites on Pinterest but I had some serious doubts about trying it. How could cauliflower even come close to tasting as good as chicken wings? Last week I saw a friend post a picture of the dish to Instagram with rave reviews. I was encouraged to give it a shot. I decided to use this recipe and I have to say it was unexpectedly a quick and easy meal to make. I added a wedge salad (Wedge salad? Oh treat yourself!) to round it out a bit. 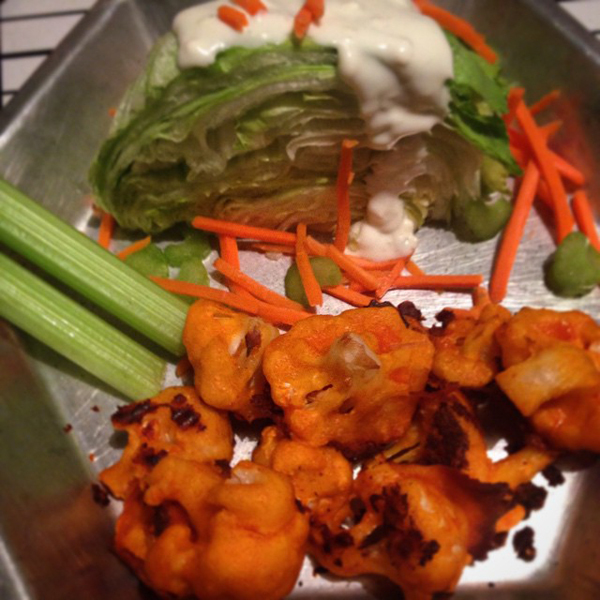 While it did not taste exactly like Buffalo wings, the cauliflower was really tasty! I was a little worried about Aaron turning his nose up at it, but he liked it too! I'll definitely be making it again.